In a society where Christmas has become for many - especially children - a secular holiday. To combat this, the Knights of Columbus has introduced the Keep Christ in Christmas poster contest. This program - similar to the Substance Abuse Awareness Poster Contest - will allow young people to engage their creative talents and imaginations while understanding the true, spiritual meaning of Christmas. The Knights of Columbus “Keep Christ in Christmas” Poster Contest is open to all young people between the ages of 5 and 14. Council level- This is the first level of the competition. Council officials should order the program kit (#CPC-Kit) by calling 203-752-4016 or visiting kofc.org/forms, promote the contest and contact schools to participate. The winning posters from the council level competition are forwarded to either the district deputy or state council personnel, depending on the circumstances in your area. District level- The district level of the contest occurs ONLY if more than one council in the district participates in the “Keep Christ in Christmas” Poster contest. Check with your district deputy to see if this is the case in your area. The winning posters for this level of the contest are forwarded to state program personnel for either the regional or state competition. Check with your state poster contest chairman or youth director for the forwarding address and deadline for entries. Regional/State- The regional level of competition usually only takes place in larger jurisdictions. In either case, scheduling, judges and prizes are provided by the state council. Winning posters at the state level should be sent to the Supreme Council Department of Fraternal Services, 1 Columbus Plaza, New Haven, CT 06510-3326. Telephone (203)752-4016. Poster must be 11x17 inches in size. If pastels, chalk or charcoal are used the poster must be laminated or covered with clear plastic. Each poster must be submitted with the Knights of Columbus "Keep Christ in Christmas" Poster contest entry form - make sure your council number is included. The name and age of the entrant should be printed on the reverse side of the poster in case the poster and entry form get seperated. All entries become property of the Knights of Columbus Supreme Council. Posters will not be returned. Judging teams should be composed of students, Knights, teachers, administrators, council Chaplain, pastor, etc. A 100-point scoring system will be used to determine the winners. Slogan-30 points: How clearly is the theme presented? Visuals-30 points: How well do the visuals convey the message? Overall Impact-40 points: How effective was the poster in capturing your attention and causing you to reflect on the topic at hand? Local councils should be ordering their kits by November 1st to be ready to present the contest in November. Posters should be completed by December 15, and the council judging should take place by December 31. International-State councils must submit their entries no later than February 28th, International winners will be announced approximately March 15th. Help us improve the Service Program activities offered by the Supreme Council office by sending reports on your council’s successful activities and/or any suggestions you may have on improving our programs. Send this information to Fraternal Services, Service Program Suggestions, 1 Columbus Plaza, New Haven, CT 06510-3326 or contact us. Please include “Service Program Suggestions” in the subject line. CIRCLE DEVELOPMENT. There are sixty two (62) circles state wide. We are at seventy (70) per cent of our state goal of ten (10) and the majority are in San Diego and Arrowhead-Desert Chapters with twenty-five (25). There are potentially thirteen (13) Corps d'Elite circles (Star Councils) and another ten California State Award Level Circles this year. The circles are at various stages of development and reporting. This development infrastructure is the responsibility of the State Squires Committee. This year each circle will receive guidance from the State Committee development activities. In addition, the goal in new circle development for is 16. MEMBERSHIP. There will be an incentive program to increase the number of Squires in California. There will be two membership drives one in August-November and another in February –April. Prizes will be announced in December and May respectively. Utilizing our newsletter (GSN)or our abilities we will send every Squire at least one newsletter via hard copies. The goal is to increase membership to over one thousand (1000). The Squires Committee has been set primarily for the next two years. The assignments are to participate on the Chapter level due to budget constraints. The current configuration is Assistant Chair 1 has Northern California, Redwood, and San Joaquin. 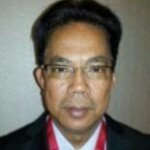 Assistant Chair 2 has St. Francis, San Jose and Oakland Chapters. 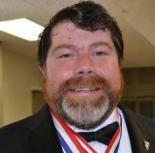 Assistant Chair 3 has Junipero Serra, Central and Inyo Kern Chapters. Currently, the Chairman has the rest of the state. The majority of the State Squires Committee are from North of the Kern County line and the majority of California's population and Squire's Circles are south of it. Recommendation. It is my recommendation that one more assistant chair or committeeman be appointed. This would be for Mission High Desert, Southern California and San Gabriel Valley Chapters. The other would be for the Orange, Arrowhead-Desert Valley and San Diego Chapters. This would bring the total of committee members to five with a chairman. Recommendation. The State committee operates a Face Book page and website and we need to stabilize this communication by the appointment of a Communication or media director. Tract One for Counselors. Enhancement of KofC integration of projects adaptable to Squires such as Food for Families; Year of faith, ID. Special Olympics and reporting requirements. Special emphasis will be programmed for the KofC and diocesan Child Protection Programs and Squires Advancement Program and counselor recruitment. Tract Two for Squires. Team building, project planning, presentation, parliamentary procedure and the Squire Advancement Program. A special emphasis will be on Squire to Knight Program.At each region or archdiocese level (combination of regions) the Squires will conduct a major youth rally or major religious ceremony. Tract One for Counselors. Enhancement of KofC integration of projects adaptable to Squires such as Food for Families; Year of faith, ID. Special Olympics and reporting requirements. Special emphasis will be programmed for the KofC and diocesan Child Protection Programs and Squires Advancement Program. Tract Two for Squires. Team building, project planning, presentation, parliamentary procedure and the Squire Advancement Program. Tract Three for Councils. The organization of circles will be a one day module for councils without circles. FINANCES. The Squires raise about $12,000 and the State Council allocates $5858 for the Squires program. This handicaps the program. I intend to raise an additional $7500 for program materials, Squire paraphernalia, membership incentive and communications. Recommendation. We need permission and a vehicle to raise corporate donations. MESSAGING, INFRASTRUCTURE AND INSTITUTIONAL DEVELOPMENT. There is no is no central message nor media campaign for the Squire Program. This message will be developed by May 2014 reviewed and unveiled at the 63rd California Squire Convention. It will be reinforced at the regional, chapter and council level. We will use low cost means of social communication and free media such as cable television, radio and Face Book. The California Squire Committee will develop its own operational manual for institutional development it will be developed for three different venues-one the KofC, two the diocese catholic school and three youth ministry personnel. These will be presented at both of California's Archdioceses and selected dioceses through the educational conferences and diocese superintendent level. SQUIRE ROSES. The Philippines and Virginia Jurisdictions have developed a Squire Rose program for young women. At one point, California was designated to develop a Squires Rose operation. One Catholic school in California has a Squire Rose Program in San Pedro. If a Catholic School receives California State or U.S. federal funds an equal or joint program must be offered for females. Recommendation. The committee will be making a recommendation on instituting a Squire Rose Program but in the interim councils and circles to continue to develop Squire Rose Circles when the council or catholic School votes to institute the program. The Knights of Columbus Soccer Challenge is a competition designed for players aged 9 through 14, boys and girls to demonstrate the most basic of soccer skills — the penalty kick. Each player will be allowed 3 practice kicks and 15 or 25 shots at the goal from the penalty line (12 yards from the goal) depending on their competition level at the time. The goal will be divided into a series of five scoring zones. The upper corners of the goal will be designated as 20 point zones. The lower corners will be designated as 10 point zones and the central region is a five point zone. To construct the five scoring zones attach a piece of rope approximately six and a half to seven feet in length diagonally across the four corners of the goal as shown in the diagram below. Use tent stakes to secure the bottom ropes to the ground. To score this competition each participant will be given 3 practice and 15 or 25 penalty kicks, depending on their competition level at the time. Points will be awarded depending upon the area of the scoring zones through which the ball passes. For example, after the player's 15 or 25 penalty kicks, his/her scores are 5/10/20/5/5/5/5/10/10/5/20/5/10/5/5, his/her total score would be 125. A score of 125 would be marked on the entry form/score sheet. 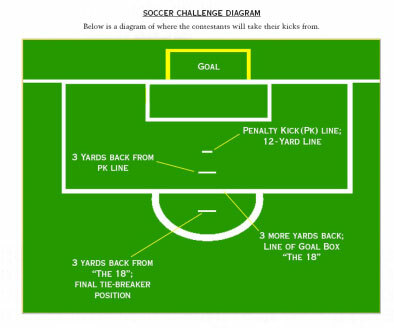 Normal rules of soccer regarding penalty kicks apply for all levels of competition. Penalty kick violations include stepping on or over the line prior to the kick, and any contact made with the ball counts as a kick. Scorers should record shots made and missed according to the instructions on the entry form/score sheet. It is also recommended that multiple scorers be assigned to each goal for scoring accuracy and comparison. All scores should be verified before the next contestant is allowed to shoot. The use of video tape recording is not recommended to resolve questions on scoring totals. Judges and scorers are given final authority in verifying all scores and violations. Judges, scorers, and ball catchers will be selected by the Soccer Challenge Chairman at the council level, by the district deputy at the district level, and by the state deputy at the regional and state levels. The recommended minimum is one judge, two scorers, and a ball catcher at each goal. It is recommended that volunteer parents be utilized in age groups other than the group(s) in which their child (children) competes. The judge will ensure that each participant receives the proper number of shots on goal and will point out any kicking violations (see scoring section). All questions will be resolved by the judges and Soccer Challenge chairman. Scorers should refer to the scoring instructions included on the entry form/score sheet. Each contestant receives three practice kicks followed by 15 consecutive kicks from the 12-yard penalty line. All age groups kick from the same distance. In the event a tie breaker is necessary, it should be conducted as follows: each contestant will have the opportunity to take 3 kicks from a position three yards behind the penalty kick line, if the contestants are still tied then they will continue to take turns of 3 kicks each until a clear winner emerges. Each contestant receives three practice kicks followed by 25 consecutive kicks from the 12-yard penalty line. In the event a tie breaker is necessary, it should be conducted as follows: each contestant will have the opportunity to take 3 kicks from a position three yards behind the penalty kick line, if the contestants are still tied then they will continue to take turns of 3 kicks each until a clear winner emerges. The Grand Knight and/or Council Soccer Challenge chairman should notify their council members, parish, schools, religious education classes, and community and soccer organizations of the date, time and location of their Council level competition. The District Deputy is responsible for notifying their councils of the date, time and location of the their District level competition. The Chapter President and/or Chapter Soccer Challenge Chairman should notify each of their Districts and Councils well in advance concerning the dates, times and locations of the Chapter Level competition. Specific date, times and locations for the Regional/State Championships are available from the State Soccer Challenge Chairman, State Program Director, Youth Activities Chairman and all "three" Regional Coordinators for the Northern, Central and Southern regions. Each level of competition should be held on a local soccer field or suitable facility approved by and under the supervision of a participating Knights of Columbus council. Check with your parks and recreation department for availability and usage regulations. Do this as early as possible, because school/recreation teams are also reserving field space. 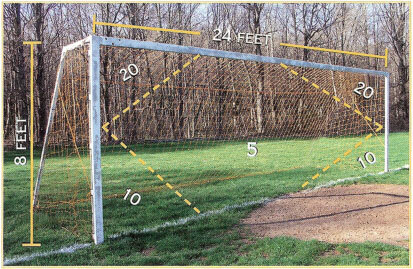 Use a regulation-size soccer ball (size #4) and shoot 12 yards from the goal (penalty kick line). Use a regulation-size soccer ball (size #5) and shoot 12 yards from the goal (penalty kick line). International champions are determined on the basis of best scores submitted from the state-level competitions in each age category. NOTE: In the event that a winner in any level cannot participate in the next level of competition, the second-place winner should represent the area for that age group. AUTHORITY: The Knights of Columbus Soccer Challenge program will be under the authority of the state deputy and state youth director. Any questions about this program not answered in this guide should be directed to the appropriate state officials or to the Supreme Council Department of Fraternal Services, 1 Columbus Plaza, New Haven, CT 06510-3326; Telephone: (203) 752-4270, Fax: (203) 752-4108. One of the most overlooked Knights of Columbus Programs is the State Scholarship, designed specifically for high school seniors planning to enter College or continuing students currently enrolled in a College or University. It is important to emphasize that this is a Council activity and not run by the state. It depends on all Councils and Brother Knights to actively promote this valuable Program that supports the youth of our State. The Primary Contact for questions from the Scholarship Applicants is the Council Grand Knight and his Council scholarship program chairman. Squire: One $1,000 scholarship (the Father Joseph Geary Scholarship) to a current or former Columbian Squire entering or resuming college. In addition to the scholarships awarded by the California State Council, the Past State Deputies Association will award one $750 Scholarship to an eligible applicant from any of the three above categories. Young people have been tempted by alcohol and drug abuse for decades now. The Knights of Columbus continues to fight against alcohol abuse and drug usage as part of the family, religious and fraternal mission. The false glamour attached to these twin evils has ruined far too many lives. The Poster Contest, which is sponsored by the Supreme Council, is part of an effort to shatter the allure of substance abuse and let young people communicate directly to one another regarding this serious topic. This competition is open to all youth from 8 – 14 years old from your community. They are asked to design and create posters that communicate a message of sobriety and the dangers of substance abuse. Their efforts are submitted to local councils for judging. After that, the winner from each council will go up to the Chapter level. The Chapter winner will progress to the State Council's Youth Activities Program. Finally, the State winner will go on for International judging at the Supreme Council. The International level winners will serve as the basis for substance abuse awareness materials to be produced and distributed by the Supreme Council. Prizes are awarded along the way to winning entries. Winning posters become the property of the Knights of Columbus. Entrant can only enter in one of the categories. The local Council, Chapter, State and Supreme Councils determine monetary or other prizes for participation. Winner and participant certificates should be awarded. These certificates are included in the Poster Contest Kit available for the Council to order from the Supreme website. http://www.kofc.org/un/en/forms/council/SA-KITOnline.pdf found on the State website under Resources or by calling Supreme 203 752-4016. There will be two essay competitions this year. One is the Supreme Competition and another is at the Council/Chapter level. The purpose of the essays is to promote an awareness of responsibility and accountability of the students in their Catholic education. Involvement is quite easy and helps develop a relationship between your Council and the youth of the community. The students and their parents become aware of the Knights and their role and involvement in today's society. Start by contacting all the Catholic schools in your area and the Youth ministries in your parishes. They will be more aware of the ideals on which our Order was founded, and they should be willing to participate. Eligibility: Open to all Catholic students in public, private or parochial schools. Essay Submissions will fall into two groups. "Ways I share My Time, Talents and Treasures at Home, School, and in My Church Community"
"In my life, who have been my Spiritual Role Models and Why?" "How do I live Jesus' Teaching, "To Love Thy Neighbor?" "How My Catholic School Education has influenced My Personal Values"
"The importance of Religious Freedom"
The Supreme Competition Kit can be ordered thru http://www.californiaknights.org found on the State website under Resources, Forms, Council Forms. This location also contains the Council/Chapter entry sheets. Awards are strongly encouraged and recommended at the Council/Chapter levels for Group A. Presenting the awards at a regular school assembly or at a Mass (with the pastor's permission) enhances our reputation as a Catholic family organization and provides a special recruitment opportunity. The essay must be 250-500 words, typed and double-spaced. Hand written essays will be accepted but may result in a lower score if illegible. All Council submissions must have the new essay form and include the signature of the student and the parent(s) or guardian. The essay will be 500-700 words, typed and double-spaced. All Council submissions must have the Supreme essay form attached and include the signature of the student and parent(s) of guardian. The Chapter will submit the best essay from each grade to the State Chairman. The State Council will advance the top essay in each grade level to Supreme. Style: Creativity and imagination in the development of the topic and use of proper vocabularyUp to 30 points. Bishop John Barres of Allentown, Penn., a former collegiate basketball player at Princeton University, is a strong supporter of the Free Throw Championship. He sees the focus and discipline required to achieve athletic excellence as being valuable in the faith formation and character development of young people. In addition, healthy competition helps young people to handle both good fortune and adversity with grace and dignity. Start planning now to get your free throw contest off to a running start. Order the Knights of Columbus Free Throw Championship Kit (#FT-KIT) using this order form. You can also use the order form in the Council Report Forms Booklet (#1436), or call the Department of Fraternal Services at 203-752-4270. Schedule a date and location for the event. Contact schools, community centers and youth centers to reserve a basketball court. January is recommended for council competitions, February for district competitions, and March/April for regional and state championships. Sign 'em up! Your Free Throw Championship Kit contains posters announcing the contest. Obtain permission to display them in schools, youth and community centers, and church vestibules. Make sure that entry forms/score sheets (#1598) are also available at these locations. Pre-register contestants whenever possible. Enlist help from schools. Ask school superintendents, principals and athletic directors to promote your championship. See if schools will hold preliminary competitions as part of their intramural or physical education programs. High school athletes should be reminded to check with their state high school athletic association about possible eligibility conflicts. Don't forget to contact and invite the recreational and youth basketball programs in your community. Build public interest. Use the sample press release in the Knights of Columbus Free Throw Championship Rules, Regulations, Tips and Information Guide (#1928) to announce your championship. Retype the release on council letterhead, giving the details of your championship. Deliver or send it, along with clip art logos, to the editors of both local news and sports sections. After the competition, be sure to send out a press release announcing the winners. When sending press releases to radio or television stations always use the program's official name: "Knights of Columbus Free Throw Championship." Be sure to send in the Participation Report Form (FT-1). This form provides the Supreme Council with informational statistics, which enables the contest to continue to be a success. When conducting the Knights of Columbus Free Throw Championship, taking a few extra steps can make the difference between a mediocre event and a great community project. If possible, get approval from the superintendent of schools to promote the program. Make a presentation to local physical education teachers to gain their support for the program. Ask local businesses to show their support with donations of food, soda, paper plates, napkins, etc. in exchange for publicity at the event and in related press releases. Award a trophy to the school with the highest percentage of students participating. Present other awards such as "Motivator of the Year" to the teacher selected by his or her peers as the embodiment of the principles of participation; a "School Spirit" to the school that exemplified enthusiasm and sportsmanship throughout the competition; and "Sponsor of the Year" to a business that made a serious commitment to the competition. Sponsor a pancake breakfast or similar event for all school district level competitors. High school-age athletes should be advised to check with their school athletic directors or their state's high school athletic association regarding possible eligibility conflicts. If there's a tie, five-shot tiebreaker rounds follow until a winner emerges. Use a tiebreaker if there is a tie for second place; the second place finisher will move on to successive levels of competition if, for whatever reason, the winner is unavailable. In the event that the winner in any level cannot participate in the next level of competition, the second place winner should represent the area group. All contestants must register using the official K of C Free Throw Championship Entry Form/Score Sheet (#1598). All entry forms/score sheets must include a parent's signature. Proof of age must accompany all registration forms and should be verified at all levels. The entry form/score sheet also contains spaces to record the contestants' scores. This form must accompany each champion as he or she progresses through the competition.